When you don't know what the result will be, it's an experiment. When you think you know the result but want to check, it's a confirming experiment. When you know the result and want to show the method to others, it's a demonstration. When you need to use the result by itself or as part of a larger process, it's a technique. This was supposed to be the day I got the band design laid out on the metal and etched. Instead, it was a day of trying all sorts of ways to scale the repeating design element so that it would fit evenly into the space. Nothing I tried seemed to work. I ended up frustrated and running out of time for the day. Finally I decided to resort to a method that I knew would work. It's not a good methond. It's incredibly labor intensive but I knew it would work because I've used it before. It's a technique, not an experiment. I spray painted the bowl with Rustoleum flat white spray paint. It works as a resist and takes pencil. The paint comes off with mineral spirits when you're done etching. That was all I got done - spray painting the bowl. It felt like I'd wasted the whole day. 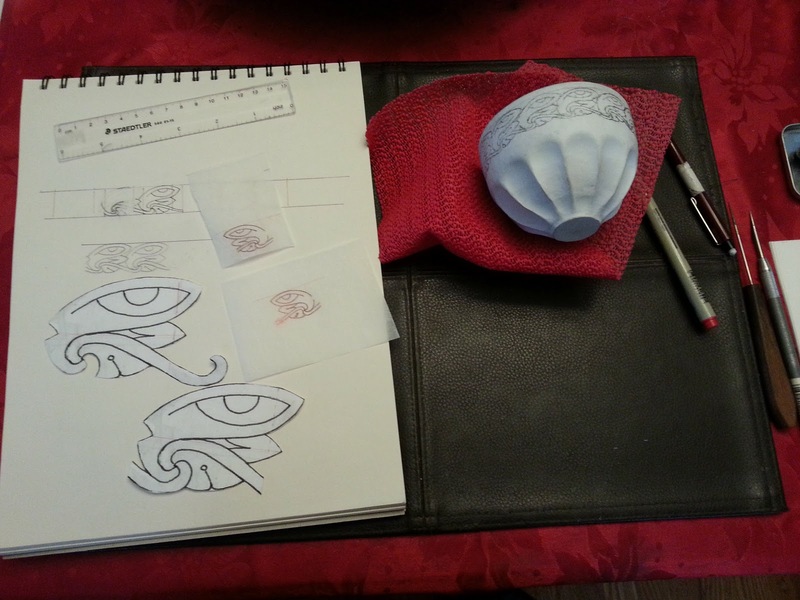 Today I figured exactly how the repeat element in the design worked and redrew it to the size I needed. I made sure that it would fit, then drew it again in ink on tracing paper. Flip the tracing paper over, redraw the lines in pencil on the back. 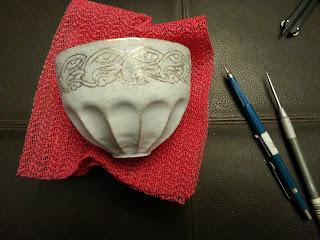 Flip it right side up, hold it onto the bowl, and rub to transfer the pencil lines to the resist. That takes the pencil off of the tracing paper, so redraw it, hold it up to the bowl shifted one repeat to the right, and transfer the pencil. Do this twelve times. Now go over the pencil lines on the bowl and fix any dropouts, smudges, and errors. Make sure it's all linked up properly. Then - go over the whole thing again with a sharp tool, scratching through the resist to expose metal to be etched. Be careful not to slip or scratch through any place that should not be etched because that will require repainting the resist to repair the defect. The repeating design drawn on. The design scratched in and ready to etch. That took hours. I have vowed to find A Better Way™ so that I never have to use this method again. But at this point I can mask off the interior of the bowl and it will be ready to soak for an hour or two in an etching bath. That's time I can use to fabricate the handles. Those will get attached with rivets and it will be ready to clean up and have a finish put on. Tomorrow. It gets done tomorrow. Whichever movie quote you pick, your perseverance is inspiring. And the results look very cool so far. I am looking forward to seeing the finished product. P.S. Ylva LOVES her cup. Thank you. And was that a Galaxy Quest quote? Love that film. SBC 9 -What's in a Name?